This event's performance date has changed (the old date was Friday, 07 Jun 2019 at 7:00 PM). The show will now take place on Sunday, 16 Jun 2019 at 7:00 PM. 14+ only. 14s to 18s must be accompanied by an adult. No refunds will be given for incorrectly booked tickets. From The Jam is comprised of legendary former ‘The Jam’ bassist Bruce Foxton, vocalist & guitarist Russell Hastings, drummer Mike Randon, and Andy Fairclough on Hammond and piano. 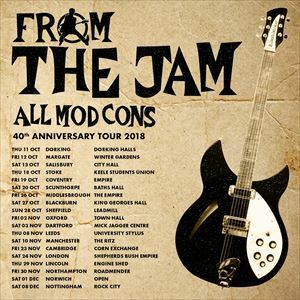 This Autumn, From the Jam will be celebrating the 40th Anniversary of The Jam’s 3rd studio album, 'All Mod Cons', playing it in it’s entirety. As well as classics such as ‘Down In The Tube Station At Midnight’ and ‘A Bomb In Wardour Street’ the band are also excited about playing ‘Billy Hunt’, ‘Mr Clean’ and more. In 2007 Russell Hastings was fronting ‘The Gift’ (which featured Rick Buckler) when he was joined on stage by Bruce Foxton (who was touring with Casbah Club) for a ‘one off’ performance. This performance sparked the genesis of From The Jam, and an enduring partnership between Foxton & Hastings. Off-stage Bruce Foxton and Russell Hastings wrote the album, ‘Back In The Room’ released in 2012, which received critical acclaim and solidified Foxton & Hastings as an excellent and contemporary song writing duo. They then returned to the studio in 2016 to record and release ‘Smash The Clock’, which reached number 31 in the UK charts. At the end of 2017, Bruce Foxton & Russell Hastings released the 'From the Jam Live!' album which celebrated the 10th anniversary of From the Jam's inception.